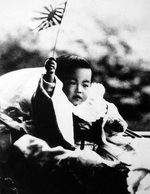 ww2dbaseHirohito, Prince Michi, was born at the Aoyama Palace in Tokyo, Japan to Crown Prince Yoshihito in 1901, who became Emperor Taisho in 1912. On 2 Nov 1916, he was made the crown prince. He was first educated at the Gakushuin Peer's School from 1908 to 1914, then a special program for the crown prince, headed by former Prime Minister Kimmochi Saionju, until 1921. On 29 Nov 1921, he became regent of Japan as his father fell ill. Prince Hirohito took an extended trip to Europe, visiting Britain, France, Italy, the Vatican, the Netherlands, and Belgium, making him the first Japanese crown prince to visit a foreign country. He became the 124th Emperor of Japan when his father passed away on 25 Dec 1926; the coronation ceremony took place on 10 Nov 1928 in Kyoto. The name of his era was Showa, which became his name after his death in 1989. Today, he is referred to nearly exclusively as Emperor Showa as a sign of respect, although many westerners erroneously refer to him as "Emperor Hirohito". Methinks all the people of the world are brethren, then. Why are the waves and the wind so unsettled nowadays? 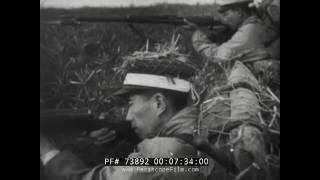 ww2dbaseNevertheless, the war preparations continued, especially the hawkish General Hideki Tojo (picked by Emperor Showa) replaced Prince Konoye as Prime Minister. Three months later, Japan's near-simultaneous attacks on Malaya, Philippines, Wake, Guam, and Pearl Harbor drew herself into the Pacific War. ww2dbaseAccording to traditional beliefs (as opposed to the new theories regarding Emperor Showa's possible close involvement in the war), Emperor Showa's role during WW2 was strictly in the realm of public relations and maintaining morale. Whenever a victory was achieved, his personal words of congratulations to the victorious units. Later on in the war when the American juggernaut became unstoppable, all engagements were still announced to the public by Emperor Showa as victories. The propaganda gave the Japanese people a false sense of the war progressions, but it kept the troops fighting on until American troops actually threatened the Japanese territory of Saipan in the Marianas. When bombs started to fall upon Japanese cities, all previous attempts at maintaining morale, by Emperor Showa or any other government official, collapsed in failure. ww2dbaseNear the last days of the war Emperor Showa led a peace-seeking faction to bring an end to the war. Prince Konoye recommended a plan to have Russia broker a peace agreement between Japan and the Allies, which was supported by the emperor. Stalin, with his personal ambitions to gain territories in the Far East by declaring war on Japan later, delayed that series of negotiations. In Jun 1945, the cabinet reassessed the war strategy, only to decide more firmly than ever on a fight to the last man. This was officially affirmed at a brief Imperial Council meeting, to which the Emperor listened in stone-faced silence. Later on in Jun 1945, Emperor Showa visited his ministers and was quoted in requesting that he desired "that concrete plans to end the war, unhampered by existing policy, be speedily studied and that efforts be made to implement them", but to no immediate avail. In the end, Emperor Showa was unable to control the hawkish elements in his cabinet, and the war continued until the total destruction of Hiroshima and Nagasaki and the declaration of war by Russia against Japan finally led to Japan's surrender. Once again breaking tradition, Emperor Showa announced his decision to surrender via a recorded radio broadcast on 15 Aug 1945. An interesting fact was that a good fraction of the Japanese population actually did not understand him; Emperor Showa had used a dialect of Japanese used by members of the Imperial court only, and was not spoken by the commoners. Nevertheless, the Japanese people obeyed their Emperor, and surrendered to the Allies. The surrender was nearly unconditional; Japan was successful in changing one clause to the surrender terms to maintain Emperor Showa at the helm of Japan's government. Furthermore, a closer look at the surrender document would reveal that, in a successful attempt to distort reality and to maintain face, he avoided any mentioning of the word "defeat" in his announcement. For more information on this speech, please see this WW2DB article on the Japanese surrender. ww2dbaseWhen General Douglas MacArthur, Supreme Commander of Allied Personnel, presided over post-war Japan as the viceroy, he maintained the much-challenged position to not try Emperor Showa as a war criminal. Despite the controversy it stirred, MacArthur's decision to avoid tainting the image of the Emperor allowed Japan to transition smoothly into an occupied territory. For that effort, MacArthur turned from one of the most hated person in Japan (before the war ended Radio Tokyo swore that MacArthur would one day be captured and hung in public in the center of Tokyo) to a beloved hero nearly overnight. He, too, was drawn by MacArthur's charisma; again breaking tradition, for the first time an emperor requested audience with someone of lower status; the Emperor Showa-MacArthur meeting produced the famous photograph of the khaki-clad American general towering over the short Emperor of Japan. 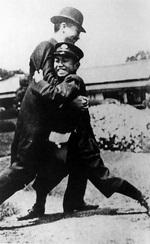 During MacArthur's time in Japan, his respect for Emperor Showa grew greatly. That admiration began with Emperor Showa's willingness to accept all responsibilities of war. "I come to you, General MacArthur, to offer myself to the judgment of the powers you represent as the one to bear sole responsibility for every political and military decision made and action taken by my people in the conduct of war", he told MacArthur. MacArthur noted Emperor Showa's courage to accept a responsibility that might mean certain death sentence, and commented that he was "the First Gentleman of Japan in his own right." ww2dbaseWith the new constitution written under the guidance of MacArthur, Emperor Showa renounced his status as a deity, and agreed to this constitution that forever forfeited Japan's capability to wage another war. With the passing of this new constitution in 1946, Japan was transformed into a constitutional monarchy. In regards to his pre-war deity status, he explained to his subjects that the ties between himself and the Japanese people had always involved "mutual trust and affection", and "do not depend upon mere legends and myths. They are not predicated on the false conception that the Emperor is divine and that the Japanese people are superior to other races." ww2dbaseFrom the end of WW2 until his death in 1989, Emperor Showa was a public figure. He played an important role in rebuilding Japan's image in the international arena, which included personal visits to the United States and Britain, among other nations. Aligning with his renouncing of deity status in 1946, he gave permission for his son, then Crown Prince Akihito, to marry a commoner. He passed away on 22 Sep 1987 to cancer as the longest-reigning emperor. He was buried in the Imperial Mausoleum in Hachioji alongside of past emperors. ww2dbaseEmperor Showa married Princess Nagako in 1924 and had seven children. His fifth child, the oldest son, is the current ruler of Japan, Emperor Akihito. In private, Emperor Showa was an avid student of marine biology, and maintained a well equipped laboratory in the Imperial Palace. ww2dbaseSources: American Caesar, the Pacific Campaign, Reminiscences, Spartacus Educational, Wikipedia. "The fruits of victory are tumbling into our mouths too quickly." 29 Apr 1901 Hirohito, Prince Michi, was born in Aoyama Palace in Tokyo, Japan. 2 Nov 1916 Prince Hirohito was made the Crown Prince of Japan. 12 Apr 1923 Crown Prince Hirohito departed Japan aboard battleship Kongo. 16 Apr 1923 Crown Prince Hirohito disembarked battleship Kongo at Kirun (now Keelung), Taiwan and boarded a train for Taihoku (now Taipei), arriving later on the same day. 17 Apr 1923 Crown Prince Hirohito visited the Taiwan Grand Shrine, Taihoku General Government Building, and Taihoku Botanical Garden in Taihoku (now Taipei), Taiwan. 18 Apr 1923 Crown Prince Hirohito visited Taiwan Institute of Research, Taihoku Normal School, Taihe Elementary School, Taiwan Army headquarters, Taiwan High Court, Taihoku No. 1 Middle School, and Taiwan Medical School in Taihoku (now Taipei), Taiwan. 19 Apr 1923 Crown Prince Hirohito visited Shinchiku Prefecture Hall, Shinchiku Higher Elementary School in Shinchiku (now Hsinchu), Taiwan in the morning. In the afternoon, he traveled to Taichu (now Taichung) by train, visiting Taichu Prefecture Hall, Taichu No. 1 Higher Elementary School, Taichu water pumping station, and Taichu No. 1 Middle School. 20 Apr 1923 Crown Prince Hirohito traveled from Taichu, Taiwan by train, traveling to Tainan to the south. He visited Tainan Prefecture Hall, Memorial of Prince Yoshihisa of Kitashirakawa branch of the Imperial family, Minami Elementary School, Confucious Temple, Taiwan Normal University, Tainan No. 1 Public School, Tainan Park, and Tainan No. 1 Middle School. 21 Apr 1923 Crown Prince Hirohito visited Beimen Salt Works, an aquaculture experiment site, Taiwan Army 2nd Infantry Regiment headquarters in Tainan, Taiwan in the morning. In the afternoon, he traveled to Takao (now Kaohsiung) by train, visiting Takao Prefecture Hall, Takao No. 1 Extraordinary Elementary School, and the port. 22 Apr 1923 Crown Prince Hirohito traveled from Takao (now Kaohsiung) to Heito (now Pintung), Taiwan by train to visit Taiwan Sugar Corporation's Ako plant, In the afternoon, he returned to Takao and visited Mount Takao (now Mount Shou) on the coast. 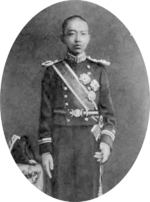 23 Apr 1923 Crown Prince Hirohito traveled from Takao (now Kahsiung), Taiwan to Mako, Hoko Prefecture (now Makung, Penghu) by destroyer. After inspecting various facilities, he reboarded the destroyer for an overnight journey to Kirun (now Keelung) in northern Taiwan. 24 Apr 1923 Crown Prince Hirohito arrived at Kirun (now Keelung), Taiwan by destroyer. After inspecting a coastal artillery unit, he traveled to Taihoku (now Taipei) by train. 25 Apr 1923 Crown Prince Hirohito traveled to Peito (now Beitou), Taiwan and visited Mount Kusa (now Mount Yangming) and a hot springs resort. 26 Apr 1923 Crown Prince Hirohito visited Taiwan Army 1st Infantry Regiment headquarters, a government-run tobacco and alcohol plant, Taihoku No. 1. Girls High School, Taihoku Butokuden, Taihoku No. 3 Girls High School, and a sports convention in Taihoku (now Taipei), Taiwan. 27 Apr 1923 Crown Prince Hirohito boarded battleship Kongo at Kirun (now Keelung), Taiwan and departed for Japan. 25 Dec 1926 Crown Prince Hirohito became the Emperor of Japan upon his father's passing. His coronation ceremony would not take place until 1928, however. 10 Nov 1928 Emperor Showa was officially crowned the Emperor of Japan, even though he had been the head of state since his father Emperor Taisho's passing on 25 Dec 1926. 16 Nov 1934 Emperor Showa visited the Nakajima aircraft plant at Ota, Gunma Prefecture, Japan. 5 Aug 1937 Emperor Showa ordered that Chinese prisoners of war would not receive the treatment demanded upon by international law. 6 Sep 1941 Emperor Showa of Japan agreed with the proposal that, unless peace could be achieved by 10 Oct 1941, Japan was to prepare for war. 30 Nov 1941 Emperor Showa ordered Prime Minister Hideki Tojo to proceed with plans to start the Pacific War, and subsequently Tojo rejected US proposals to de-escalate tension in the Far East. 1 Dec 1941 At an Imperial Conference held in Tokyo, Japan, the decision was taken to go to war with the United States. According to Prime Minister Hideki Tojo, Emperor Showa, the country's devine ruler, did not utter a single word in response. 22 Jun 1944 Japanese Emperor Showa, in conversation with his younger brother Prince Takamatsu, gave approval "in principle" to the use of special attacks. 30 Oct 1944 During an audience with Navy Minister Admiral Mitsumasa Yonai, Emperor Showa noted "It is truly regrettable that it should be necessary to go to this extreme, but they have done well", referring to the suicide tokko attacks on American naval vessels. 12 Aug 1945 Emperor Showa ordered his government to surrender. 1 Jan 1946 Emperor Showa of Japan renounced his divinity. 19 Sep 1988 Emperor Showa collapsed from internal bleeding at the Fukiage Palace in Tokyo, Japan. 7 Jan 1989 Emperor Showa of Japan passed away at the Fukiage Palace in Tokyo, Japan. Ah nice article, but out of curiosity when did you publish this article? (I want to use this in my report and I need to cite it). Cool Article. Gonna use this in mah biography.